Elfed Thomas was born in Glendros, Swansea, the son of Benjamin Thomas, a coal miner, and his wife Rachel. In the 1911 Census the parents and an elder child were recorded as bilingual in English and Welsh, while the four year old Elfed was recorded as only Welsh-speaking, indicating that he was brought up in a mainly Welsh-speaking household, though of course he would have started to learn English when he started school the following year.Less than two miles from Glendros the local council had established in 1896 the Gowerton Intermediate School, the aim of which was to take pupils forward beyond the then current elementary school level through to university entrance level. Over the decades a considerable number of Gowerton students went forward to university in Swansea and elsewhere and on to distinguished national and international careers in education, science, industry, the arts, sport and the public services, and Dr. Elfed Thomas is one of those honoured by the Gowertonian Society as a “Notable Gowertonian”. It is presumed that as with most Gowerton students going on to University he would have studied at the then new Swansea University College, founded in 1920, of the federal University of Wales, now Swansea University, though so far no details have been found of his recorded university degrees (BSc and PhD) or his early career. However, at a still young age he was appointed Director of Education for Caernarvonshire, organising among many other things summertime adult education classes on “Wartime Cooking” during World War II. This was followed by a few years as Director of Education for Swansea, during which time he gave evidence to the House of Commons on implementation of the major changes in the structure of education being introduced under the 1944 Education Act, and he was also appointed as a Welsh education expert to a new government advisory body on education. 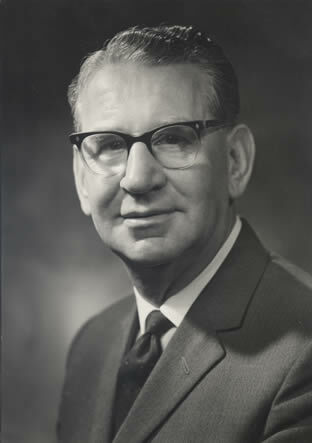 At the beginning of 1947 he became Director of Education for Leicester, where major initiatives included the establishment of the Leicester Teacher Training College in 1947 and the National College for the Training of Youth Leaders, based in Leicester, in 1960, with Thomas a the Secretary to the new government-appointed Board of Governors. As the Director of Education for a major city he had the opportunity to carry forward his long interest in the education of children with disabilities both in developments in Leicester’s own facilities which were widely copied elsewhere, and more particularly in chairing a major national inquiry on behalf of the British Council for the Rehabilitation of the Disabled, and which resulted in his 1965 Report: The Handicapped School-leaver (London: Tavistock House). Following his retirement as Leicester’s Director of Education at the end 1971 Thomas moved back to Wales and settled in the Swansea suburb of Sketty, only a couple of miles in each direction from his birthplace, Gowerton School and Swansea University, where he was Vice-President of the Council from 1976 – to 1984. In July 1972 the University of Leicester recognised his many achievements both locally and nationally by awarding him the degree of Doctor of Laws Honoris Causa. He died in Swansea in 1984. Presidential Address: Address by the President [on the education of the handicapped] Trans. LLPS, vol. 64, (1969-70), pp. 5 – 16.